Do you know what it takes to successfully market your business in our technologically advanced, digital world of tweets, blogging, hashtags, and trending topics? As a full-time digital marketer, I am no stranger to the balancing act it takes to stay on top of the multifaceted and chaotic world of marketing trends and innovative tools. Followed by thousands on social media and voted a top influential blogger by digital experts. I am a three-time lead marketer turn consultant specializing in content marketing and social media strategies to maximize revenue and propel my fellow marketers to the top of their game. My journey began in corporate finance and eventually shifted to engaging with online communities drenched in marketing jargon. Formally educated in finance (#UF MBA), economics, and law. My knowledge has launched me into some of the most prestigious positions in the digital marketing world. As Head of Marketing at Pagewiz, I honed the skill of conversion rate optimization. I mastered the art of social media analytics as the Director of Marketing for Klear. I was a project manager and collaborator as Director of Online Marketing at dapulse. Experiences which have all proved to be invaluable. In addition to lending my experience and knowledge to consult with fellow marketers and colleagues, I also offer online courses and workshops which are geared towards B2B Marketing and Funnel Automation, Advice on Influencer Marketing, and Growth & Content Marketing Strategy to assist you in mastering the marketing world. As a Digital Marketing Strategist, I have established 4 highly influential blogs and successfully created must-follow social media feeds and viral posts. I have developed engaged communities of followers for clients while collaborating with key social influencers in various industries. An award-winning blogger, my unique experience is layered by collaborating in marketing communities including Inbound.org, GrowthHackers & Product Hunt. My early days were spent as a finance banker and corporate attorney where attention to detail and interpersonal skills were vital to success. Prior to which, my exposure to military life as a Major in the Israeli Home Front Brigades and has defined both my self-discipline and work ethic. Currently, I’m an active contributing member on Social Media Today and Business 2 Community. I have provided method-based narrative on popular publications such as SAP, SEMRush, Curatti, and Launch & Hustle. And I have placed expert round posts on Mad Lemmings, Profit Blitz, and Robbie Richards. I’m ranked 2nd of the Top 50 Best Global Influence Marketing Blogs by InkyBee. I’m listed 14th out of the Top 50 influencers in B2B Marketing by Onalytica. 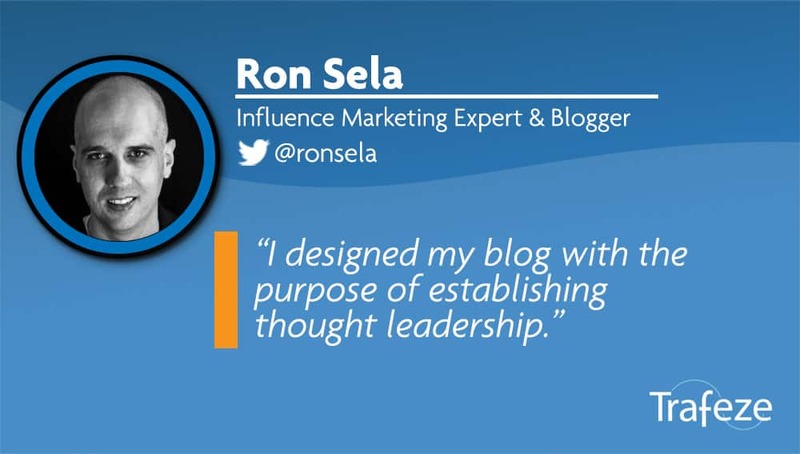 Named one of 10 Influence Marketing Bloggers You Should Follow by LaunchMetrics. At 14k Twitter followers, I am considered one of Top 100 Content Marketing Influencers by Onalytica. That’s where I thrive. Diligently trudging my own path. I am effective at ramping up revenues using social media strategies, content marketing, search engine optimization and pushing conversions with inbound marketing techniques and amplifying brand awareness. Awarded, recognized, and accredited, my expertise and proven methods are the Mecca for innovative marketers and those seeking to join the digital movement. Whether your social media savvy or prefer traditional media advertising, my blogs, online courses, and collaborations are based on endless research and tried and true techniques from years of experience in all facets of marketing. I invite my fellow entrepreneurs and professionals, whether looking to advance their knowledge or stay on top of innovative trends to connect with me and other digital promoters right here! For more marketing tips, advice and the latest posts connect with me via my website www.ronsela.com and through my various social media channels and blog, or subscribe to free email updates.